Are these two shirts the same? 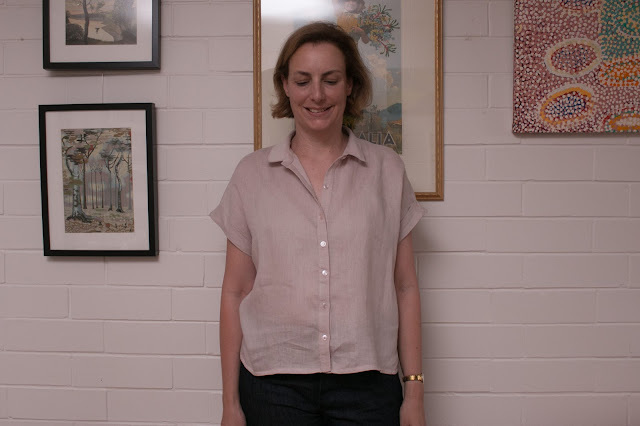 The pink linen shirt is the Style Arc Blaire shirt, which has been pretty popular around the net but which is often not made up as the pattern dictates. 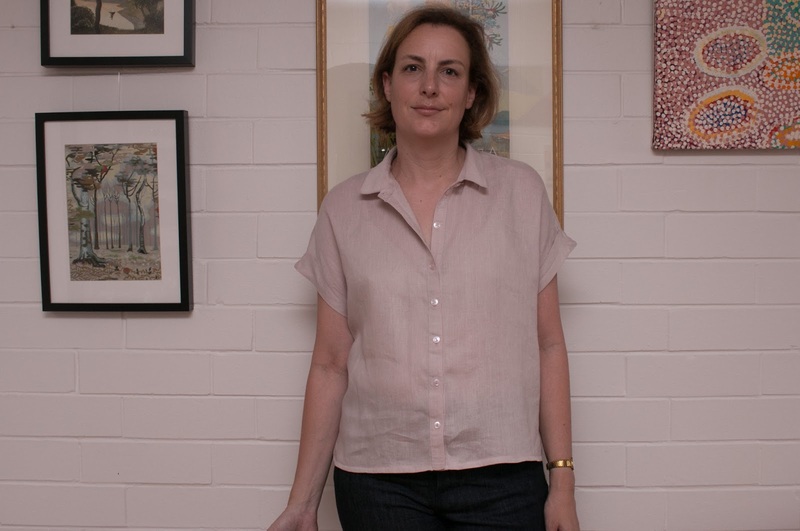 The actual pattern has a three-part front with an underlay and a flapping about overlay on the lower half, and a small collar. I wasn't inspired by it until I saw Kelly's version, which showed it made up without the apron front and not buttoned up to the top that I was inspired to make it up and like Kelly I combined the three front pieces into one, just by patching them together with paper clips and laying them over the fabric. 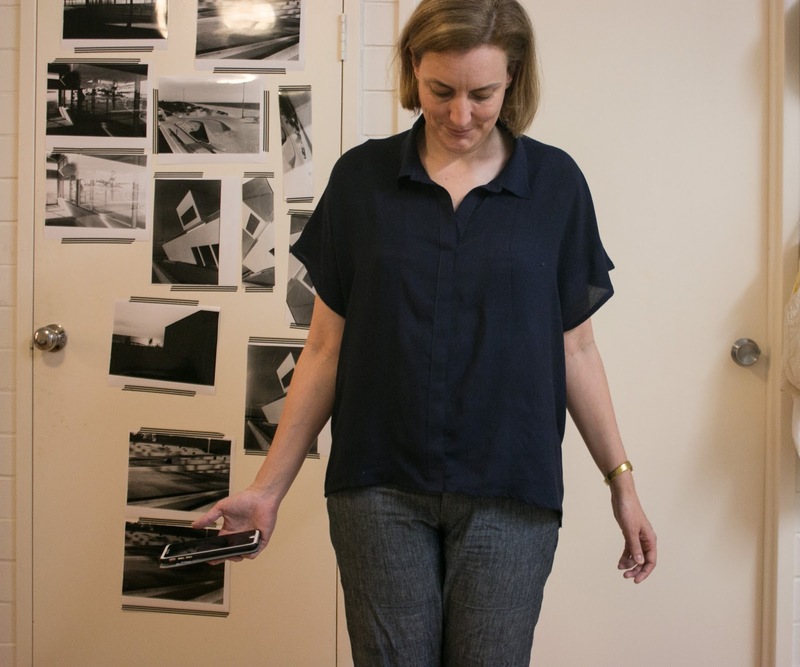 The instructions are Style Arc's usual minimalist quality -- attach collar, attach placket etc. I used the Grainline archer instructions for the placket and the trust four square walls method for the collar. 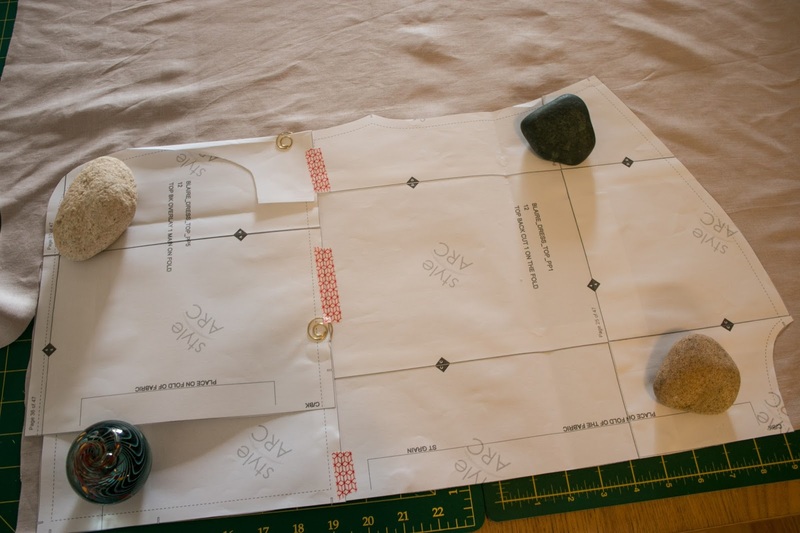 The instructions have you interface the entire placket which, folded over and in fact four layers at the seams, makes it extremely stiff and when making it again I would only interface half the placket. It also instructs interfacing both collar and collar stand pieces which seemed to work ok, although the 5mm seam allowance for the collar made sewing it a careful exercise. 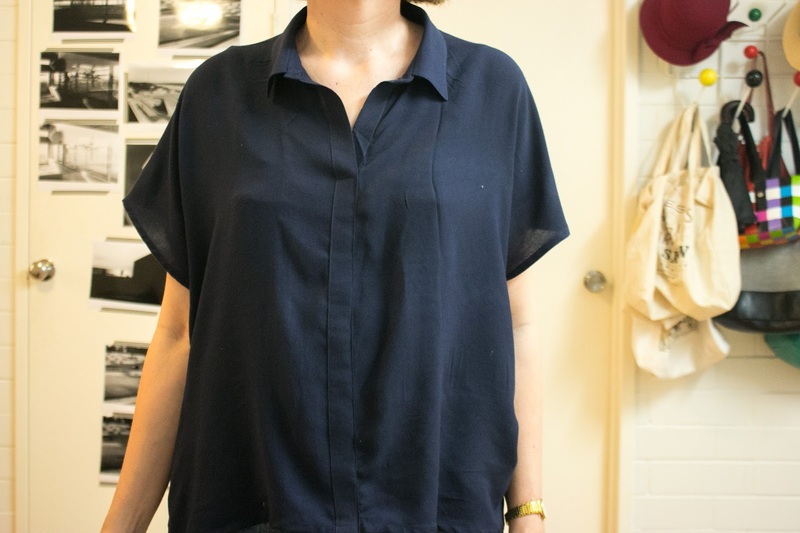 I really love this shirt, the cropped boxy look is quite pleasing and it seems to go with quite a few things, from work shirts and trousers to jeans and shorts. I've already got another cut out in rayon ready to sew up. 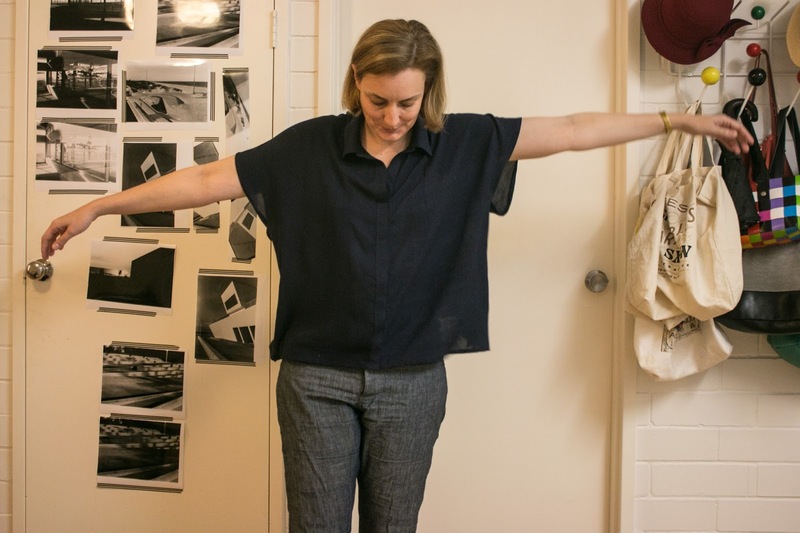 The navy blue shirt is a Style Arc Maude, and when I first saw the pattern on the website I burst out laughing, because it looked so like the Blaire without the flappy front, and I assumed she had just decided to bow to public demand and release a pattern for the shirt that everyone had been making. But while similar in design there are a few key differences in construction, and when I had a look at it more closely I was so intrigued that I bought the pdf straight away and made it up that night. In the description it says: This cleverly drafted pattern has no shoulder seams and the outside top-stitched side seams allow this tunic to flow with ease. No shoulder seams? Looking at the line drawing it seemed to have no back seam either, so I was imagining one truly enormous pattern piece that created back and each front in one piece. But in fact, after I bought it I discovered the line drawing has an error and there is in fact a centre back seam. Still this still makes for an extraordinarily large pattern piece and a collared shirt with just three pattern pieces. It's impossible to cut the front-back piece on the fold, even on wide fabric and it would likely be a tricky pattern to make with striped or patterned fabric, as the back piece forms on the bias. 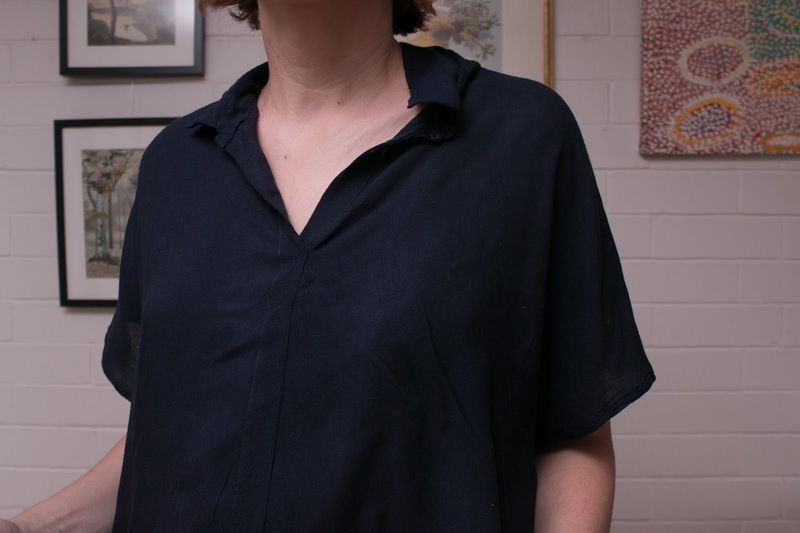 The front placket is formed by folding the centre front over several times and it's left up to the maker whether and where to add interfacing -- I added one strip the width of the placket to each side. 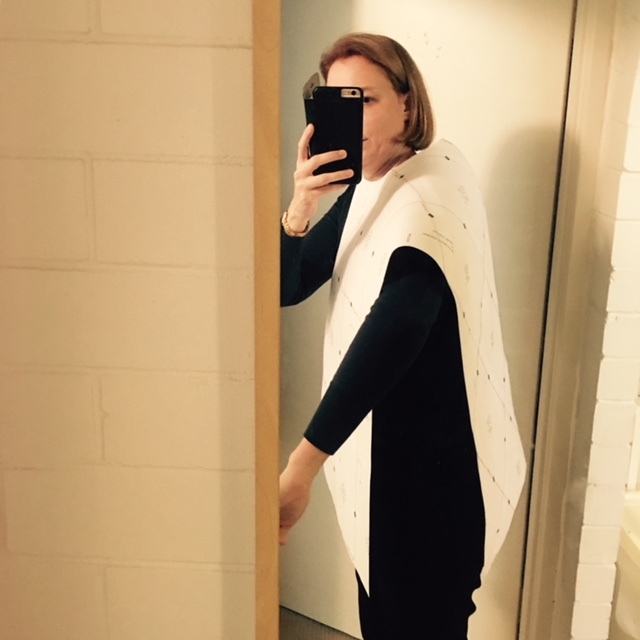 Another thing that is not particularly clear is that the side seams are formed by top stitching the front and back pieces together a few centimetres in, having first hemmed the sides and front and back. After trying it on with the collar on, I decided I wanted a neater, less exposed finish and created the side seams with a narrow seam about 10mm in. I also shortened it front and back by 10cm. 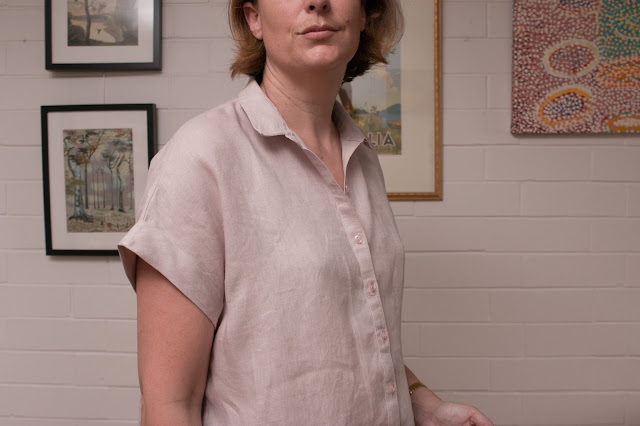 Style Arc calls this a tunic, not a shirt, and I just felt that the length combined with the very loose style might have made it too much of a sack. I also made it easy by stitching the placket up rather than using buttons, and it slips easily over my head. This version is made of a super soft, light, probably-not-high-quality navy blue rayon from Textile Traders and it's heavenly to wear. 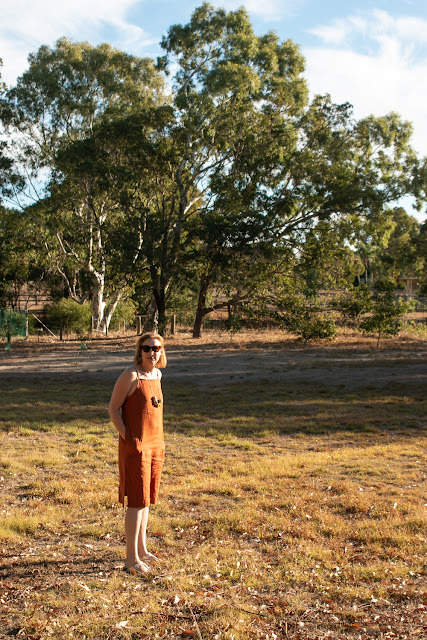 The lack of shoulder seams make it flow and yet it's fairly smart tucked into a skirt. I love this top, it's basically a t-shirt with a smarter look. I've already made a black version of Maude and have a white one cut out, also both in rayon.